The Courts vs. The People: How Activist Judges have Overturned Common Sense Measures against Illegal Immigration and how the American People are fighting back. This event is meant to spark conversation on campus about the issue of illegal immigration. Students of all viewpoints are welcome and encouraged to come. Ms. Buchanan will take questions after the speech. Bay Buchanan is president of the American Cause, chairman of Team America PAC, and a commentator for CNN. She served as treasurer for Ronald Reagan's '76 and '80 presidential campaigns. Ms. Buchanan was the youngest U.S. Treasurer in American history during President Reagan's first administration. Mrs. Buchanan chaired all three of (her brother) Pat Buchanan’s presidential campaigns. This election cycle she was a senior adviser to Tom Tancredo and then Mitt Romney. If you guys put your minds to it, i'm sure you can out-length the post count in the concealed-carry thread in this one. You couldn't get her brother Pat? Losers. bay buchanan on illegal immigration, really? it's such a red-herring to the real problems our country faces right now. she's really pulling this subject out from the last pages of the neo-con playbook, isn't she? 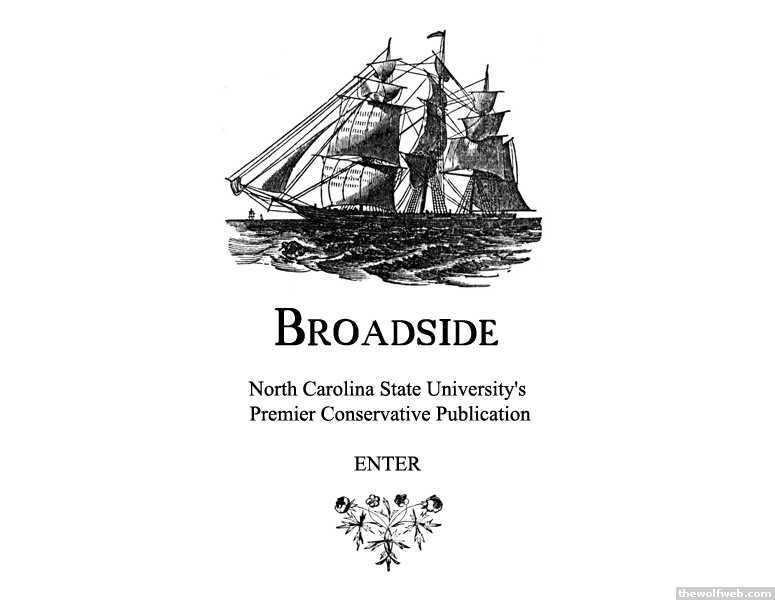 what's most sad to me is that the Broadside is still being published. I wonder how they scraped together enough cash to land buchanan. "I actually did a re-design of their site one afternoon for fun"
i just looked at their site. woefully inadequate is the phrase that comes to mind. maybe you could sell them your design. "it was very colonial/john paul jones"
i'd like to see it. got a link or a screenshot? ah, that would have been a cool design concept. i think their problem goes way beyond design, tho. all their links are dead and what content they do have is almost laughable. in my limited experience, i found that their editiorials was stuff that was either rejected by or never submitted to the Technician. overall, not any better or worse. just kind of like, "they wont publish all of my (our) various rants, so we'll make our own rag". haha, activist judges. More like inactive minds... amirite?